A surreal-looking amusement ride from the 1970’s called the Turbo has hundreds of devoted fans ready to schedule their vacations and travel to distant places for its comeback. Though only 23 Turbos were manufactured by Chance Rides from 1970 through 1976, and none are currently in operation, two are being lovingly restored in California and Australia. The 635 members of the Turbo Amusement Ride Fan Club, a private group on Facebook, are eagerly awaiting the chance to go for a retro spin. A few days ago, when an ad for a Turbo for sale in Zhejiang, China appeared on usedrides.com, excitement ensued. The price: $49,000. No sooner were the pros and cons of a crowdfunding campaign to buy it being discussed than ATZ learned from the seller that the ride, which had been brought from Australia a decade ago, had sold to a park in Canada. 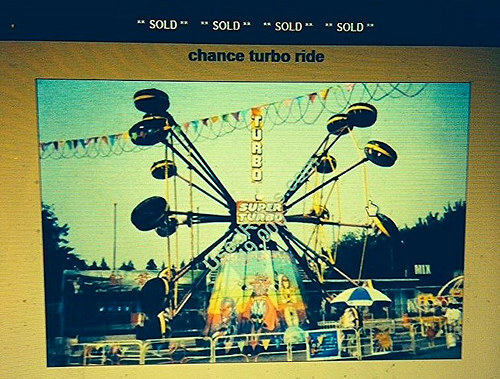 “Playland in Vancouver,” seller Jack Su told ATZ via email. A call to the park seeking comment has yet to be returned.